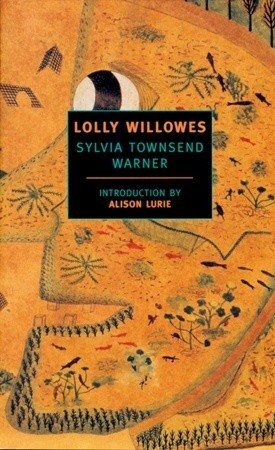 Today’s letter in the Really Like This Book podcast scripts catch-up is W, and today’s author is Sylvia Townsend Warner. She began her career in the 1920s as a musicologist and a specialist in Tudor church music, and died as a respected poet, novelist and biographer. She had her first literary successes all around the same time, in 1926: a volume of poems called The Espalier, and a novel called Lolly Willowes. 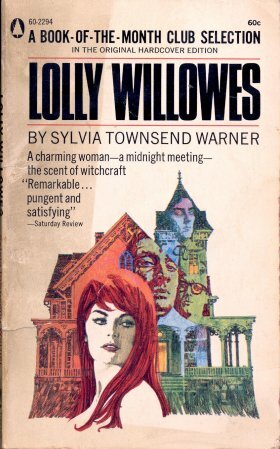 Lolly Willowes is a great twentieth-century novel about witches and feminism, and about the right of a single woman to be left alone to do what she wants. 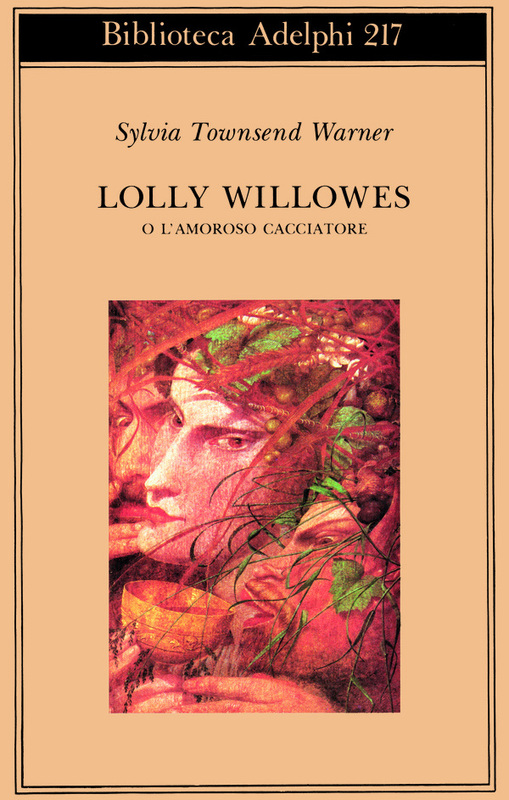 When I wrote about John Updike’s novel The Witches of Eastwick I said I’d been doing some research on witches: Lolly Willowes is one of the books I’ve been working on. (You can find the details of my long article about this novel here, and also on my academia page.) 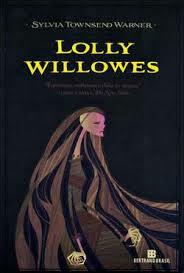 There is surprisingly little about Lolly Willowes on the library shelves, but it’s been a highly popular novel for decades. Readers love it, and they love it much more than Warner’s other novels, which are somehow less easy, more challenging, less conventional. 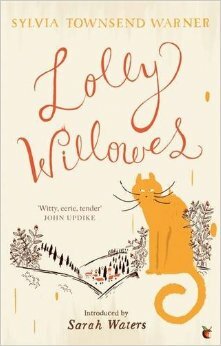 Not that Lolly Willowes is conventional, oh no. Its charm comes from the way Warner turns all the conventions upside down on their heads, and pokes about inside the hollow shell of proper English behaviour. So, the story is that Laura Willowes grows up happily in her father’s house in the country, but is moved on his death to live at her married brother’s house in London. She is turned into a useful middle-aged spinster living in the second-best spare room, in a comfortable Kensington lifestyle. Everything has to be done in a certain way that is suitable for her class and her situation in life. She is policed by her brother who knows best, and her very conventional sister-in-law, and is slowly turning into a family heirloom without even her proper name to give her distinction. She’s been Aunt Lolly for over twenty years, and when the novel begins she is completely taken for granted. The trouble starts when Laura begins to hanker for the countryside. She buys chrysanthemums on an impulse, and is intoxicated by their scent, the thought of where they grew, and how they came to London. The seed of longing for escape has been planted. She decides to leave her brother’s house and buy a small house in the country, and this is when she finds out that her wise protective older brother has lost all her money for her on unwise investments. She leaves his house the next day, to look for rooms to rent, and settles on a small village at the end of a valley in Buckinghamshire: Great Mop. Laura will live here, and become one with the countryside again. But her family are loth to let her go. Just as her family cling to her, distracting and confusing her with visits and assurances that she will be home soon where she belongs, something else is affecting Laura’s understanding of who she is, and why she is at Great Mop. She roams the hills and fields, she studies her guidebook, spends all day out of doors trying to find the source of the presence she can feel in the woods and along hedgerows at dusk. Exasperated, she finally throws her guidebook down a well, and finds peace instead. She has accepted the countryside for what it is, not for what a book tells her it is. And this is when she starts to have a suspicion that there is more going on in the village on certain evenings than she has noticed before. The women of the village seem to have a club they disappear to on random evenings, and there is a self-important verger at the church who seems to have a resented authority in connection with this. He is not a pleasant man, but when he is teased and annoyed by some of the village boys, and goes home in a rage, the boys’ mothers make sure he is placated with cakes and fresh eggs left at his door. At night Laura can hears a strange music in the sky, but her landlady, the reserved but kind Mrs Leak, tells her that it is young Billy playing his mouth-organ to chase away the toothache. This 1960s US reprint cover is a JOKE, its AWFUL. One evening, Laura is finally invited to join Mrs Leak for a walk in the woods. Other women overtake them on the track, and it feels rather as if they have joined a Women’s Institute outing. The self-important verger is waiting to admit the walkers through a field gate, and many people are already there, greeting and laughing and chatting. Laura is very uncomfortably reminded of attending dances as a girl, and of always being the odd one out. But she now realises that she has been brought to a coven. She is introduced to the great lady of the parish, who greets her as an equal, and recognises the faces of some excited girls and staid older matrons of the village. And then the dancing begins: she recognises the music now. Laura manages fairly well by being scooped up by different partners, but after an hour, being passed from partner to partner has tired her out, so she sits in a hedgerow and waits for the devil to appear. This is where Warner is very inventive, since there are three devils for Laura to meet and assess. Warner is very keen on women using their natural good sense and their intellect to question the accepted order of things, and to observe with their own eyes rather than relying on what people tell them. Laura has met and rejected the verger, Mr Gurdon, as nothing more than a self-important gate-keeper. The devil who appears at this coven is a masked and smug young gentleman, very pleased at being the centre of attention, who takes liberties with Laura that enrage her to the point of stalking out of the coven, out of the field and away into the wood, furious at having been put in a false position. She still values civilised behaviour. She is so angry she walks for hours, and then sleeps where she drops, knowing that the earth will shelter her. When she wakes on the hillside it is dawn, and there is a man coming towards her, a gamekeeper in country clothes, who is polite, and they chat. Of course, this is the real devil, and Laura realises that she was accepted into his company and service when she threw the guidebook into the well and cast herself onto the guidance of the earth. Warner’s writing style and narrative have a lot in common with Virginia Woolf. She and Warner, who were writing at the same time, have the same educated but apparently simple approach to telling their story and asking their questions. The obvious is stated when it is necessary for the story, and it is always free of cant. There is no pretentiousness, no pomposity, no showing off. Warner writes about countrywomen and country intelligence without bringing in the value judgements of the intellectuals. When Laura’ nephew Titus invites himself for a visit, he jars, he disrupts the female companionship Laura has had with Mrs Leak, and their class suddenly matters. Naturally, Laura’s new witchcraft sends him away in gentle stages, just as she also finds a way for her sister-in-law to be taken away early from a very tiresome visit to Great Mop by the opportune arrival of a committee woman in a car. Laura tidies away difficulties, and is quietly ruthless in her treatment of those she does not like. This is my favourite, an Italian translation using a detail from Richard Dadd’s painting The Fairy Feller’s Master-Stroke. 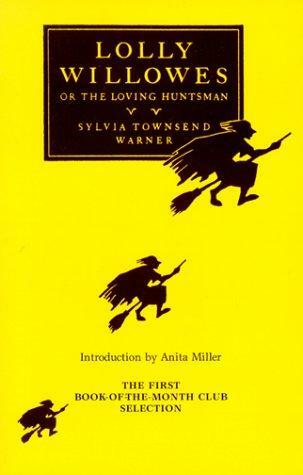 One of the most interesting things about Lolly Willowes is that it was one of the first of a sudden eruption of novels about witches to hit the market in Britain in the middle of the 1920s. Warner didn’t quite set a fashion, but she was at the crest of a wave. She was also saying something in this novel that would be said in print, only a few years later, much more famously, by Virginia Woolf in A Room of One’s Own: for a woman to live a fulfilling life, she needs to be left alone, to have a door to close against the world, and to have some money to live on. Woolf set this out for women who wanted to write. Warner is quite clear in Lolly Willowes that women should be allowed to live alone, and to not have to bother with what other people want, once in a while. Too much of women’s lives is spent looking after other people’s needs, with the cleaning and cooking and tidying and arranging. There needs to be time for women to see to their own needs. We don’t all need to become witches, but witchcraft was Warner’s way of articulating this as an example, in Lolly Willowes. It’s a marvellous book: small, perfect and simple. This sounds really good – I’ve to read anything by Warner before, and this seems like a good place to start. I was wondering about the Woolf connection, since your description of Laura’s initial situation is very like that of Lady Slane in Vita Sackville-West’s ‘All Passion Spent’ (I’ve not read ‘A Room of One’s Own’). I don’t actually know that there was a Woolf – Warner connection. They moved in different spheres, and once Warner moved to Dorset she would have been out of Bloomsbury’s reach, had Bloomsbury wanted to reach her, which I doubt. Her Communism and her interest in music and domestic arts would also not have corresponded well with the focus on visual art in teh Woolf / Bell households.